Devoted to the Spiritual Elevation of Humanity / Devoted to Spiritualism and its Philosophy. Utica, NY; Grand Rapids, MI. Editor: David Jones, editor and publisher. 1/1, January 1876-1890(?) 16-20 pp., 11 x 13. Originally free of charge ("a love offering from the spirit world") / $1.00 a year. No advertisements. 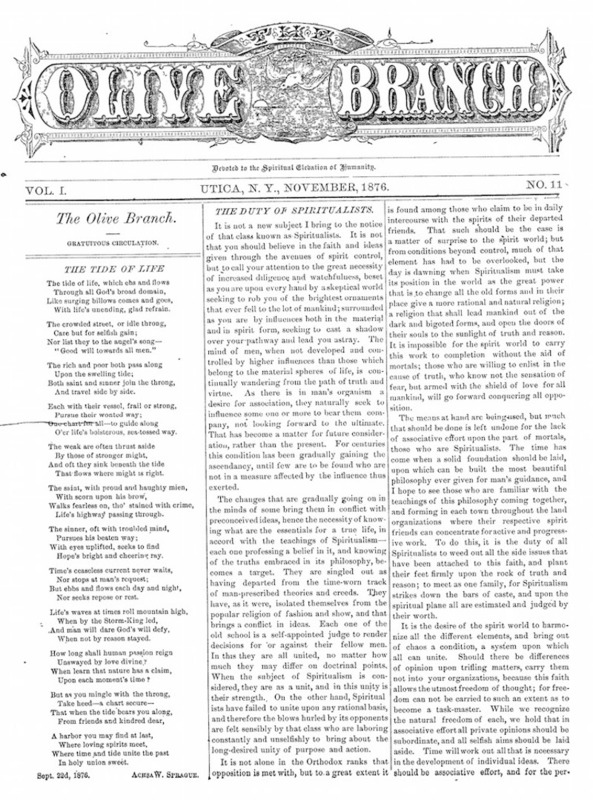 Published articles by W.J. Colville and others, but favored interminable discourses by the spirits of deceased Universalist ministers like Dolphus Skinner and T. Starr King, and historical figures like Joan d’Arc and John Milton. The History of the City of Grand Rapids (1891) says that The Banner of Life, an eight-page weekly spiritualist journal published by W.E. Reid was later published as The Olive Branch. Jones is known only as the unfortunate foil for Juliet Severance in a published debate on the inferiority of women. The prospectus for the journal for 1877, issued under the name of T. Starr King "in behalf of the Spirit Circle," says that it would be "under the direction of the Spirit Circle" and contain "Original Matter, most of which will be given by mechanical writing" through David Jones, medium, and would contain the wisdom of the ancient sages of the last 250,000 years, including Confucius and Leiah, the last King of Ancient Arabia. By 1881, as Mind and Matter complained, Jones, the medium and editor, "had left spiritualism to soil himself with Bundyism" -- i.e., had had second thoughts about the more phenomenal side of spiritualism. University of Rochester; Stetson University (Florida); Wisconsin Historical Society; Hamilton College. Volume 1, Issue 11 below is provided by the Special Collections of the Burke Library at Hamilton College. Volume 3, Issue 1 is provided by the University of Rochester.